" You are my Angel." Rose gold plated luxe cubic zirconia angel wing pendant comes on a rose gold filled chain. Made with round and baguette cubic zirconia. Perfect gifts for yourself and loved ones. 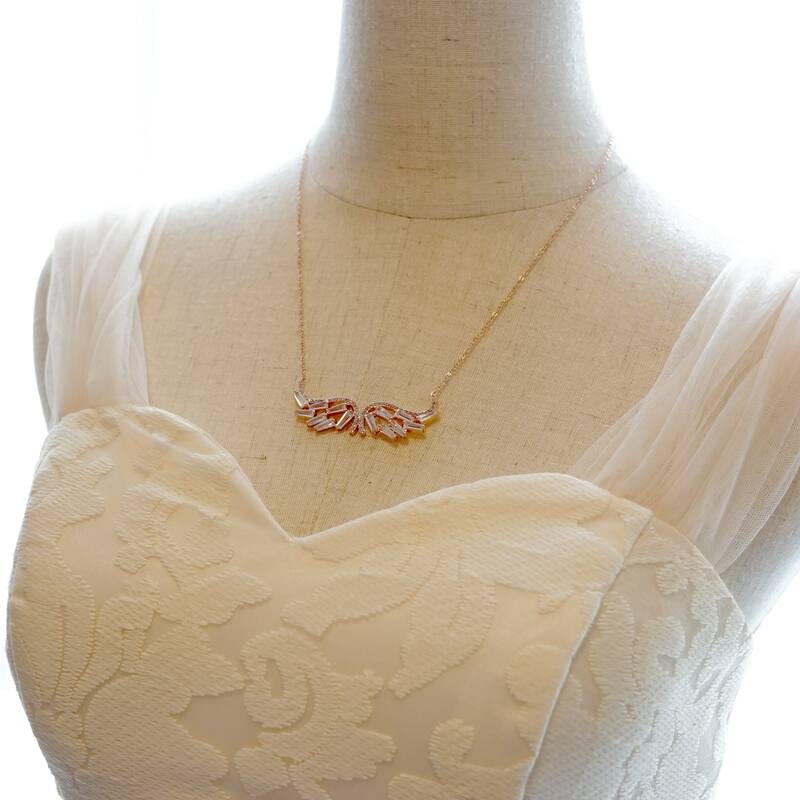 Perfect for bridal shower gifts, bridesmaid necklace. ✦ Length: Please choose from the length option. ✦ Beautifully gift wrapped. Perfect to keep or give. ✦ Thank you for visiting / shopping at Color Me Missy! ⁕ International shipping: at least 14-25 WORKING days to deliver. ⁕ Arrive to you in around 1 - 1.5 month(s). ⁕ Please read our announcement, policy, and shipping info before committing to purchase. ⁕ By placing an order, you have already Read, Understood and Agreed with the Announcement and Policy. ✦ All prices listed are in US Dollars. *Discount code is not retroactive, and must be used in the same order. ✦ All payments are to be made through to my PayPal account. ✦ Don't have a PayPal account, don't worry. PayPal accept credit cards and debit cards payment. Just click on the PayPal button at checkout and pay with your credit card. "How can I purchase an item with a credit card through PayPal?" ✦ All jewelries are made to order, and therefore, final. ✦ All orders will be shipped in 3-8 working days, unless otherwise stated in the listing. ✦ Will ship to address shown in the etsy receipt only. ✦ Color Me Missy is located in Singapore. - 14 - 20 working days* to reach the rest of the world. *Working days exclude weekend and public holiday. - Exact delivery time will depend on the post offices, the above estimates are the average time. Suggest to order early to have some time for buffer. - Most will arrive within the time frame, some may take slightly longer. ✦ All orders are shipped via registered airmail with tracking which requires a signature upon delivery. Once items are mailed out, I will let you know the tracking details through the "add shipping info" function in the invoice. It is customers' responsibility to track the package. Please start tracking the package 2 weeks after the shipment. Please let me know if you need any assistance. - For purchase above USD 150, it is highly recommended to upgrade the shipping to DHL express mail as it is much safer. - I am Not responsible for Lost in Mail if mailing by International registered airmail ( by your country post office and Singpost). The efficiency and reliability depends entirely on your country post office and Singpost, and is out of my control. I will not be held responsible for lost in mail by international registered airmail as I have suggested a safer method ( DHL express mail), in which you can track where you package is every step. - If you decide to upgrade to DHL express mail, please purchase the link below and let me know your PHONE NUMBER, it is required for the DHL form. ✦ Please keep in mind that BUYERS are Responsible for any Customs fees or Taxes imposed by Customs for an order are separate from the shipping charges. - Customs fees and taxes will vary, and we recommend that you contact your local Customs office should you have any questions or concerns about these fees. And customs fee is totally nothing to do with SHIPPING COMPANY or me. - All packages shipped from Color Me Missy will include a declaration indicating the contents as "Fashion Jewelry" "Fashion Earrings" "Fashion Necklace" "Fashion Ring" "Fashion Bracelet", with full value for the order listed. A package returned to us due to refusal of these charges will result in Color Me Missy being charged for the shipping, return shipping and Customs fees, and future orders will not be accepted until these fees are reimbursed. I am unable to alter the declaration of Custom forms. I apologise for any inconvenience. ✦ All items will be packed with lovely gift boxes/bags, perfect to give or keep. ✦ Any questions or requests, just send me a ETSY message. I check it everyday. ✦ All shipping tracking information will be entered to the invoice. You can track the item after information has been entered after actual shipment. ✦ Insurance is extra, so please let me know if you would like insurance. As all items are sent via registered post with a tracking number, I am NOT responsible if items are lost by the post offices. 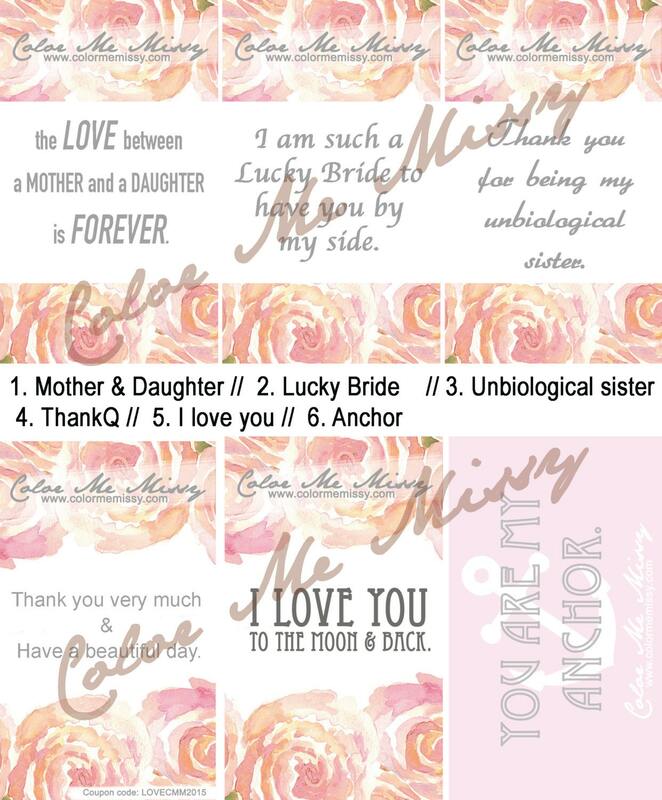 ♥ All Designs, Descriptions and Photographs are copyright of and protected designs for ColorMeMissy(TM). Please do not copy. As I want happy returning customers, if you're not totally happy with your purchase, exchanges are acceptable (on a case by case basis). If you wish to return the items to me, please convo me within 3 days of receipt of your item/s. If more than 3 days from receipt of the items, there won't be any refund, return or exchange as I assume that you are satisfied with your purchase. As all the items are shipped with Registered Mail, I can trace when my customers receive the mail. Strictly NO returns on earrings as only Brand New pairs of earrings are sent to my customers. I do not send returned earrings to my customers. There will be 30% restocking fee for return/exchange items. Strictly NO returns on headpieces as once they are all custom made to order. For custom orders/custom quantities and Wedding Jewelry multiple sets, I do not accept returns or exchange as I need to spend huge amount of time to make them. If you are unsure, please purchase only one item to see first. - Custom orders include custom length ( standard length of necklaces is 17 inch, bracelet 6 inch, all other length are considered custom length). - Custom orders include custom pearls, crystal, material, and anything else that is different from the pictures as shown in the listing. ✦ If you have any doubt, you can purchase one first to see whether they are the ones that you want or not. ✦ Items shall be returned back to me by Registered Mail in their original condition & packaging, with unused condition. Shipping cost is NON-refundable and buyer has to bear all additional shipping costs (i.e. cost to ship items back to Singapore + cost to ship exchanged items back to you). - items that a customer doesn't like due to his/her personal taste, expectations on the jewelry's effect on him/her or his/her dresses after reading the item description and examining the photographs. - Items that have been worn and damaged due to negligence. - items bought while on sale. - customized items, including items with customised chain length and customised bridal orders. If you do not receive the item by 20 working days from the date posted, please convo me and I'll do the detail enquiry of the status of your mail with Singapore Post Office. Please track the package at least once a week. If no one is at the address to sign off the package, post office will leave you a notice to pick up from the local post office ( most within 2 weeks), otherwise the package will automatically be treated as 'unclaimed' and sent back to me. Therefore, please keep an eye on the tracking status, especially after 12 working days from the date posted. If your purchase is returned to me due to UNSUCCESSFUL DELIVERY, I'll only refund 70% of the item price (exclude shipping charges) as I've spent time for ordering the supplies, making the jewelry, packing and a trip to post office. The refund will be made only after I've received back the items safely. Unsuccessful delivery will usually take additional 1-2 months to reach back to me. Refund will be made through Paypal to the same email address shown in the invoice. ✦ What is the length for the necklace? Unclasp the necklace and lay it out straight. Put it right next to a ruler, measure from one end (the clasp) to the other end (where the clasp will be hooked on to when the necklace is being worn). 1) the chains and all findings are rose gold filled. 2) most charms or pendants are rose gold plated over brass, some are rose gold filled. 3) a few charms or pendants are rose gold filled. 4) the wire used are rose gold filled. 1) the chains are sterling silver. 2) the findings are silver filled. 3) the charms or pendants are rhodium plated over brass, some are sterling silver. 4) the wire used are sterling silver. ⁕ All chains are high quality Sterling Silver / Rose Gold Filled / Gold Filled. All jewelry will tarnish over time due to exposure to perfume, moisture, chemical and air. Please keep your jewelry away from moisture and in an air tight bag when not in use. If your charms are plated, the plating will eventually, and inevitably, wear off. Its impossible to say how long it can take, because it varies from person to person. It could be two weeks, two months or two years. To slow tarnishing/wear, please avoid wearing your jewelry in swimming pools, showers, or hot tubs, and always spray perfume or hair products before putting on your jewelry. Store your jewelry in an airtight Ziplock bag or jewelers anti-tarnish pouch to slow the tarnishing process. ✦ We sell nothing but high quality, all chain used are either Rose Gold FILLED or STERLING Silver. For Sterling Silver jewelry, if an order is shipped and then sits untouched for MONTHS, tarnish does occur, this is a natural chemical reaction to the surrounding air and happens with even the most expensive designer sterling silver jewelry, NOT JUST OURS. Tarnish is especially prevalent in the summer months, humid seasons, and during lengthy international transits. To restore luster, simply use Silver Polish Cream ( like Wrights Silver Cream) to easily restore luster, thank you very much for your understanding! If you paid through Paypal balance, refund is instant. If you paid through your credit / debit card through Paypal, the amount will show up in your statement with or without any caption. ✦ For wholesale buyers, please message me. Can I pay with my credit card without a Paypal account? Yes. You can pay your order with a credit card via Paypal without a Paypal account. You may use Paypal as a guest to pay with a credit card. Do you offer bulk discount? We are unable to accommodate self-collection at the moment. All purchase will be mailed out by Registered Mail / DHL express mail [upgrade required for DHL].